of coaches making a name for themselves. 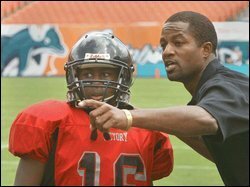 Dedrick Dodge ('86 - '89) recently resigned as head coach of Victory Christian, a 1-B high school in Lakeland, to become defensive coordinator at Fort Valley State, a Division II school in Georgia. In 2005, Dodge led Lakeland's Evangel Christian to an 11-3 record and the 1-B state championship. When Evangel ended its program, Dodge and most of his players moved to Victory Christian where they hardly skipped a beat. This year Dodge guided The Storm to a 10-4 mark and the 1-B title game, where they lost to FAMU High. He also had four players earn spots on the 1-B All-State first team. Before he moved into coaching, the 39-year old Dodge played eight years in the NFL (for Seattle, San Francisco, Denver and San Diego), with two Super Bowl rings to show for it. 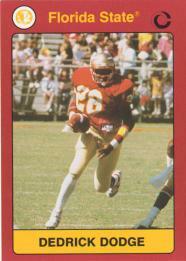 Dodge's new boss at Ft. Valley is another former Nole, Deondri Clark ('89-'92 ). Clark (pictured right) came to Fort Valley State last year after a successful stint at Shaw University in North Carolina. 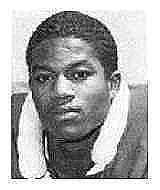 During three years at Shaw, Clark was 22-10, won a CIAA Championship and beat Tuskegee in the Pioneer Bowl. Dodge is already recruiting for Ft. Valley, while packing for the move to middle Georgia. He took time out to talk about his playing days and coaching career. G&G: That's quite a leap, going from Florida's lowest high school classification to a college program. Dodge: "I was coaching at 1-B because I wanted to coach at 1-B, not because I had to. I'd turned down graduate assistant jobs and different things. I just like coaching kids. Just because a player plays in 1-B or a coach coaches in 1-B, doesn't mean they can't excel at a higher level. And when this opportunity came along, I thought it was a good chance for me to get some college experience and hopefully one day move up to the college D1 level, which is a goal of mine." G&G: Talk about what you learned from Coach Andrews. Dodge: "Coach Andrews has given me a lot. I've just taken what he's given me and a few other things I've picked up along the way, and try to mold a player to be the best they can be. So they have a chance to go the next level, whether that's from high school to college, or from college having the chance to play in the NFL. "In my time, Coach Andrews was younger — but he might have been a little more feisty. We had so many great coaches that we all just fed off each other. We all also lived together (in the same complex). Now with kids spread out all over Tallahassee, you don't have that continuity you used to have." G&G: Do you stay in contact with Coach Andrews? Dodge: "I go up there periodically, especially during the summer, and talk with them and stuff. You know, with great coaches, I like to sit down with them and pick their brains. Find out what they do." G&G: How much is your coaching based on what you learned at FSU? Dodge: "I tell kids, 'This is how we did it at Florida State.' I still refer back to Coach Andrews, always. He taught me everything. Every drill, every instinctive thing that we needed to know, I learned from Coach Andrews. Only thing I learned when I went to the NFL was different defenses. And the game was faster. But all the fundamentals and techniques? Coach Andrews had us ready." G&G: Obviously, the FSU connection was key in being offered the job at Ft. Valley State. Dodge: "Deondri Clark offered me the defensive back coaching job a few years ago, but I wasn't able to take it at the time. I'm in a little better shape now to make the move. I used to help him when he was at FSU. I was kind of a mentor to him then, and I think he never forgot that. I'm a protege of Coach Andrews and so is he. Everything he wants to do is predicated on what Bobby Bowden and Coach Andrews have taught us. And he wants more guys like that around him, because we're cut from the same cloth." G&G: Is your NFL experience a big plus in coaching and recruiting kids? Dodge: "How impressive is it for a kid to have somebody who's played against Jerry Rice and other great receivers? That's played with Deion Sanders? I just came back from a big recruiting day at Ft. Valley, and I wore both of my Super Bowl rings. I told them, 'You want to get this jewelry? You want to know what it takes and how to prepare?' So they look at us a little differently because we've been there." G&G: Will the new FSU coaching staff return the program to its glory days? Dodge: "I think they're gonna turn it around. The offense has struggled some, and sometimes the defense just gets worn down. And I think that's what happened to them a little bit." FSU as a coach, like former teammates Lawrence Dawsey and Dexter Carter? Dodge: "That's always the goal. You just try to get yourself prepared and put yourself in the position that if the opportunity ever arose like that, of course you'll take it. Everybody always wants to go home. Florida State will always be my home, and I'll always bleed Garnet and Gold."